Once again, I am writing this post late, but dating it as if it were on time in order to preserve the loveliness of having a post for each day. -If the US (the white portion, at least) and Mexico started to battle, and the outcome of the war was determined by dancing skills, we would lose, my friends. Mexicans have rhythm, coordination, hips. We have slightly ashamed bobbing from one foot to another, with some exuberant YMCA arm action when needed. When the Cha Cha Slide faded (oh how I hate that song), and the banda music started to play, all us whities left the floor, confused, while the Mexicanos paired up and danced actual steps! There was poise, finesse, and Nate and I even spotted a discreet tush grab. I was jealous (not of the goose, but of the skills). Goose bum ... get it? 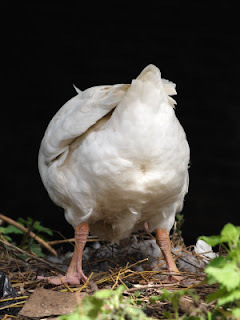 Goose bum? -Mexicans know how to dress up for a party. I had a picture of Graham and his gorgeous new aunt that I wanted to post, but I lost our camera on the way home! Arg. But she looked lovely. Her dress had pockets! How awesome is that? And her guests: glamorous. Lots of shine, high high heels, and gowns. Not dresses, gowns. I was in an ill-fitting polyester number and felt dreadfully out of my league fashion-wise. At least I had a cute baby on my hip--the ultimate accessory, even if he was doing his grunting baby eagle squawk during the slide show. A composite image of all Llubia's guests. -This is a reflection on weddings in general: they are great. Weddings are the ultimate combination of family, tradition, love, fun, and food. Mmm fajitas! I'm so glad we were able to attend Justin and Llubia's wedding. Even though I don't know either of them super well, I think my bachelor's degree (sniffs and adjusts spectacles) allows me to declare them great together (but you don't need a degree in marriage and family studies to know the obvious!). Lost lost. :( We're hoping it turns up in Southwest's lost and found because we are pretty sure it fell out of our bag on the plane.